The Battle for the Klatu Sector takes place over 5 distinct locations at roughly the same time. Klatu Sector, though on the edge of the Outer Rim, is useful for its ore mining and gas farming. It is also riddled with places that smugglers and the Rebellion use as outposts and bases. 5 Battles – 515 points per side total. No less than 75 points per battle per side, no more than 155. Unique pilots and ships can only be used once per campaign. An asteroid field rich in ores, this is a boon to either the Rebels or the Empire to capture. Rules – 6 asteroids – Advanced Rules – Two small asteroids move at 1 move at the beginning of each turn. This system has been used as a staging ground for the Rebellion. Completely open field of battle. The moon of Boraan is rich in timber, soil and fossil fuels. But during the clone wars it was booby trapped with hundreds of thousands of mines, concealed in cargo crates. Now, both Rebels and the Empire are drawn here on stories of lost tech hidden in the tall jungles of this moon. Rules – 6 Containers. 3 have concealed bombs. If any ship hits or stops on a container they container gets flipped to see if it has a red mark. If so all ships within 1 range suffer 1 damage. Also, if a seismic charge goes off near a container and it has a bomb in it, that bomb also goes goes off. The site of a major battle during the clone wars, the space is littered with ship wreckage. Rules – 8 pieces of debris. 7 Smaller than asteroids. One larger. If a ship intersects with a piece of debris, no damage is accrued, but that ship loses its action. Nikto the gas giant is a great resupply source of hydrogen and helium. It is surrounded by a large ring of ice particles and rocky debris. Rules- 1/3 of the battlefield to one side is littered with debris from the ring. 6 Asteroids, 3 smaller debris. 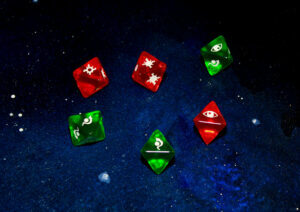 Star Fighter Accessories, Including dice! Click the Image.